Something slightly different this week, with some scanning at the Royal Botanic Gardens at Kew. I was contacted by a former UCL colleague and alumnus who now works in the GIS UNIT at Kew, where they are interested in capturing the structure of some of their oldest and more unusual trees. In part this may be to preserve them, if only virtually, for the record. But more immediately, the team there are exploring new ways to monitor and manage old trees for their own health and that of the visitors - large falling branches are potential hazard! We went out to Kew and scanned one of the oldest trees in the gardens, an oriental plane, ancestor of the London plane, planted in 1762 (or perhaps earlier) and now rather venerable, hollow, and listing in places. 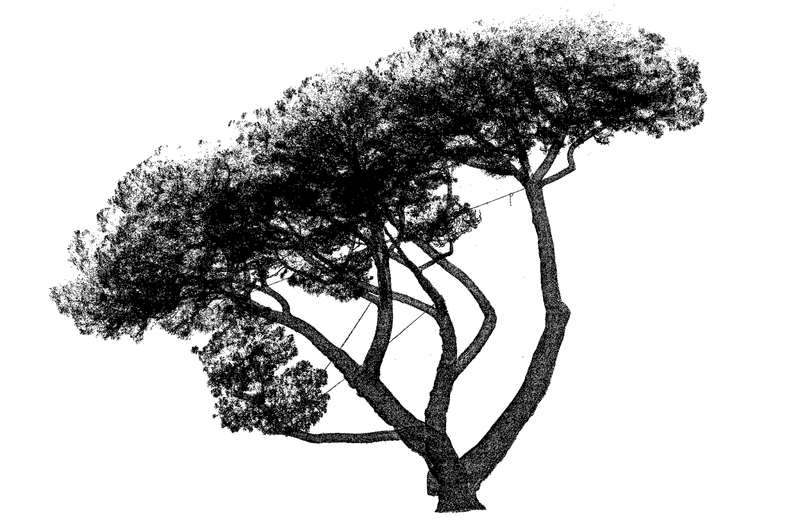 We also scanned the renowned stone pine, planted by Princess Augusta in 1846, and kept in essentially bonsai conditions. It's not little any more as you can see below and the odd shape is a result of the early pruning, but of course leaves it very prone to falling over and breakage. Bonsai stone pine, with guy wires in the centre. 170 years old, 14m high and rather elegant. Oriental plane, planted 1762 (perhaps earlier), before the sun came out. 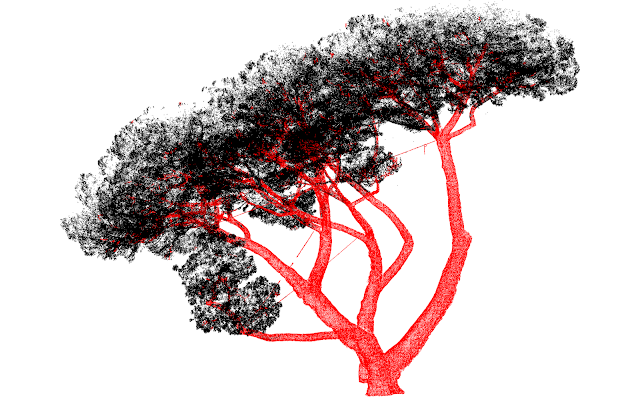 Heavily downsampled point cloud from 3 scan locations, of the stone pine. As above, but this time with Andy's defoliation algorithm applied, and the remaining wood-only parts coloured red. Hopefully we'll be able to get back and scan the Plane leaf-off, after some remedial surgery has been carried out. We should then be able to see what the possible effects are on the remaining structure, if any. A very civilised place to work: you can scan lovely trees, get a very good coffee and a cheeky croissant and even chat to some of the visitors! Fieldwork at its most genteel. Nature's Greatest Survivor: the oak tree doc gets aired! So the Oak tree documentary is finally going to get shown - looks like 1/10/2015. Here's the trailer - and you can see a quick snapshot of one of our scans about 35s in. Exciting! There's also some of the drone footage shot while we were there, and it all looks beautiful - as it should I guess! Kim has been working hard on co-registering the 370+ scans we collected from Wytham over the summer. He's managed to pull together the scans and put them into some sort of order, along the LAI2000 and 2200 data and everything else - great job! The co-registration of the scans looks pretty good so far, but is likely to improve as we use the multi-station adjustment on it. But Kim's first fly-through already looks VERY impressive - this includes scans made from the Wytham walkway and so gives a great view up and around the canopy. As far as I know I don't think anyone has ever scanned as large a chunk of forest as this in such detail so far. The next steps will be pulling out and reconstructing the individual trees, and comparing the resulting models with the inventory data, comparing the structural information with the other ground-based measurements (PAI, LAI, gap fraction), looking at clumping, and then building the canopy radiative transfer model that will allow us to look at fAPAR and satellite signals. 6 ha plot at Wytham Woods, with the scan locations (red) and the reflectors (crosses) marked. Each reflector is seen from a minimum at least 2 scan locations minimum, and up to 25 maximum, but mostly between 5 and 6 scan locations. 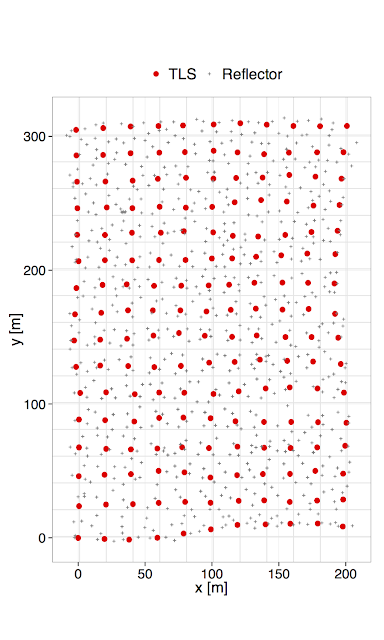 This is a useful way to think about how many reflectors we need, the density of scans and so on, as we do this in more locations.